The triangular fibrocartilage complex (TFCC) is a cartilaginous disk that connects the radius and ulna bones. 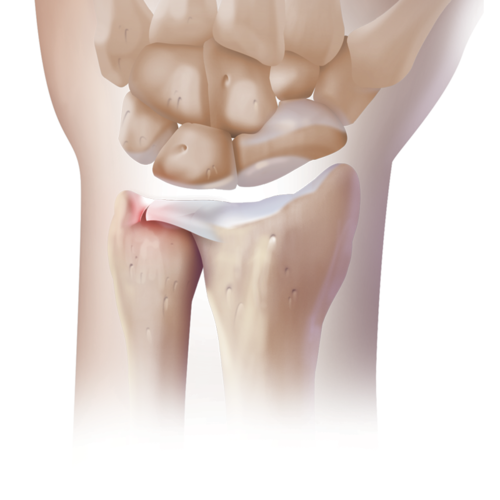 It is attached to a part of the ulna called the styloid and acts as a cushion for the joint. Injuries to the TFCC occur during fall onto an outstretched hand, a direct blow or trauma to the wrist including a twisting injury. Baseball, softball and racquet sports put the TFCC at particular risk for injury. Patients complain of pain in the wrist. A 'click' or 'pop' may be felt with wrist motion. There may also be loss of grip strength. Your surgeon will examine your wrist and assess for pain to the touch, pain with ulnar deviation of the wrist joint or a palpable click in the wrist with movement. Physical therapy is used to strengthen the wrist and restore range of motion. A splint or brace may be used to immobilize the wrist. Anti-inflammatory medications or a cortisone injection may be given to decrease the patient’s pain. Often, the pain associated with these tears may subside with time or immobilization. If conservative treatment fails, your surgeon may recommend an operation to repair, reattach or debride the TFCC. This may be done arthroscopically by connecting the TFCC back to the ulna with suture and a bony tunnel. Alternatively, small anchors containing suture are placed outside of the joint, and are used to repair the TFCC.